Every year a national campaign called Books Alive is run to ignite Australia's passion for reading. A major part of the campaign is the Great Read Guide. You can pick up your copy from any of our branch libraries. The Great Read Guide is a collection of 50 remarkable books, selected by an independent panel of book industry experts from right around Australia, across a range of genres and styles: biography, crime, fantasy, history, science, children’s books and more. There is something for everyone in the 2007 Books Alive Great Read Guide. A couple of the books from this year's Guide have sparked my interest. The Memory Keepers Daughter by Kim Edwards, a book that explores ramifications of a split second decision. A doctor, forced to deliver his wifes twins, realises that one of the babies has down syndrome. He orders the nurse to take the baby away to an institution and informs his wife that their daughter died. A Short History of Tractors in Ukrainian by Marina Lewycka. Any book with a title like this surely deserves a chance! The Beginner's Guide to Winning the Nobel Prize by Peter Doherty, winner of the 1996 Nobel Prize for Physiology and Medicine and Australian of the Year in 1997. A book that gives an insight in to the world of science and how scientists have contributed to our understanding of the world, answering questions such as why scientists and born again Christians can't get along in the process! I'm sure you can find something in the Great Read Guide that tickles your fancy. Be sure to leave us a comment if you read one of these books and let us know what you thought. After few months hiatus, Yourtutor online tutoring service has returned to Sutherland Shire Libraries. Library members in years 4 to 12 can access one-to-one tutoring from home in an online classroom from expert tutors in a range of subject areas. You can read more about this service in this post. Tutors are available from 4pm until 8pm, Monday to Friday. To login visit our web site. We would love to hear from you if you have tried YourTutor. Let us know what you thought by leaving a comment. Do you Speak Greek, or Know Someone who Does? Sutherland Shire Libraries are introducing a collection of Greek language books. We have for some time had books, magazines and DVD’s in Arabic and Chinese languages available for loan and we are expanding this service with a small collection of Greek language books. Please pass this news on to your friends and relatives. This is a trial collection has been introduced in response to a large number of Greek Bulk Loans requested during the previous year. Bulk Loans are boxes of books in a specific language borrowed for 3 months from another library service, usually the State Library of NSW. The books are then available for any of our customers to borrow. Anyone can request a Bulk Loan. If there are books available in your chosen language we will get them in and let you know when they are here. The new Greek collection includes novels such as Gynaika me triantaphyllo by Helene Sarantite, Phader Hēmōn by Manos Vourakēs and Ta megala koritsia den klaine by Mpesse Livanou. Some of the subjects covered by the non-fiction collection are health, cookery, world politics, history and biography. At Sutherland Library, Community Language material is shelved behind the Enquiry desk on the ground floor. If you can’t find them please ask. Branch Libraries also have small collections. There are millions of people in the world suffering extreme cold. Wrap with Love Inc provides knitted wraps to warm people around the world. Miranda Library is currently accepting donated knitted wraps. Wrap With Love is non profit, non denominational, non racist, non political and is incorporated with the NSW Dept. of Fair Trading. 'Cold humanity is their concern, humans caring about other humans'. If you are interested in contributing to this worthwhile cause drop into Miranda Library for more information or visit Wrap with Love. We are now taking bookings for our Term 3 Internet Training program (July - September). We cater for absolute beginners with our Introduction to the Internet & Email course and we are running a Digital Photography & the Internet for people who want to make better use of their digital camera. More information can be found on our Course Information page. The next Introduction course starts on July 24. Details of future course are available on our Events Calendar. For enquiries or bookings please telephone Sutherland Library on 9710 0351. Q: Why does a blue-tongued lizard stick its tongue out? Yes, this and many more amazing facts were learnt about the animals presented at Feature Creatures at Sutherland Shire Libraries in the July School Holidays. There was a stick insect that wanted to jump off its carer and onto the jungle vines in the children’s section at Cronulla. And a frilled-necked lizard that wanted to run outside and bask in the warm winter sunshine. Boys and girls got to see and touch stick insects, frogs, tortoises, pythons, a bearded dragon, frilled neck lizard and all sorts of other creepy crawlies at Cronulla and Miranda Branch libraries on Tuesday 3rd July. The theme for the school holidays is ‘Bugs and Beasties’, and there are fun activity days to be held at all branches, with stories, rhymes, games and crafts. No need to book – just turn up. * Blue tongues use their tongue the way we use our noses – to smell the air. Find out if you are at risk of diabetes at Sutherland Library from July 10-12 2007 - Know your risks! Kareena Private Hospital / Diabetes Australia will be conducting free blood glucose tests at Sutherland Library from 10am until 11am on July 10, 11 and 12 as part of National Diabetes Week. National Diabetes Week 2007 will be targeting the entire Australian community. 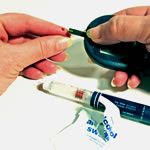 Diabetes is the fastest growing non-infectious disease in the world. For every person who has diabetes there is another person who has it and doesn’t know. Diabetes is a serious health condition. There is no cure. If left untreated it can cause heart attack, stroke, kidney failure, blindness, amputation, and erectile dysfunction. If diagnosed early, diabetes can be effectively managed and the risk of serious health problems greatly reduced. Type 2 diabetes, the most common form of diabetes, can be successfully managed or even prevented by maintaining a healthy weight, engaging in regular physical activity and having healthy eating patterns.